I threw a little something together today to add WYSIWYG editing to BuddyPress, using TinyMCE. I want to be careful about the tags I allow, so I’m whitelisting, which is a bit tedious. As a result, there are only a few buttons available: a, em, strong, ul, ol, li. It’s a start, though. Seems to work everywhere in BP: forums, wire, messages, profile pages. A note about TinyMCE: WP ships with TinyMCE, and I thought it made sense to use that version instead of attaching one to this plugin. I think that the path to TinyMCE (line 18 of the plugin) should work on all installations, but you may have to tinker if you don’t see it popping up in the head of your BP pages. Moreover, the language files for WP’s version of TinyMCE are misnamed, which means that they don’t work right out of the box (at least for me they don’t). You may need to change the name of wp-includes/js/tinymce/langs/wp-langs-en.php to en.php in order to get the hover and help text in the TinyMCE box to work. Download the plugin here. Don’t use in a production environment unless you are very certain that you are satisfied with the security of this plugin! In my view, the most powerful feature of BuddyPress – the feature that powers the core goal of the CUNY Academic Commons, that of collaboration – is groups. By default, BuddyPress only lets you invite other members of the community to your group if you and the member are already friends within BuddyPress. In some communities, this feature probably prevents a lot of spam. But in other communities, like the one here at the Commons, the friendship requirement adds a sometimes inconvenient extra step to the process of getting a productive group up and running. 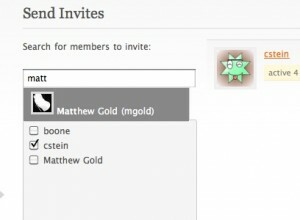 This new plugin, Invite Anyone, does just what its name claims: it alters the group invitation process to allow group creators and administrators to invite anyone from their BuddyPress installation, not just their friends. Like so often happens, though, solving this one problem made another one pop up: Scrolling through a list of your friends to find potential invitees is one thing, but scrolling through a list of every member of the site is another thing entirely. Most communities, including the CUNY Academic Commons, will simply have too many members. To make things easier, I’ve taken the autosuggest feature from the Compose Message screen in BuddyPress and retooled it to work on the Send Invites screen as well. Start typing the name of the user you’d like to invite, and with each letter you type, BuddyPress will make better and better suggestions as to who you mean. Just hit enter or click to add the suggested user to the invited list. Download the plugin here. As the plugin is built using the BP Group Extension API, you’ll need at least BP 1.1. After I’ve done a bit more testing with our custom theme here on the Commons, I’ll activate the plugin on this site, so that members of the Commons community can take advantage of the new feature. A technical note: I tested the plugin in a variety of different environments (different browsers, different themes, different servers) and stumbled upon a few issues, in particular with the autosuggest AJAX in Chrome for Mac. If you find similar issues, or have any other feedback, please leave a comment. Rodney Blevins and Marius Ooms wrote a fantastic plugin for BuddyPress called Groupblog, which allows BP groups to easily create a blog associated with their group. The killer feature of the plugin is the ability to add all group members to the blog (as authors, editors, subscribers, whatever you’d like) in a more or less automatic fashion – a far, far easier task than adding users manually through Dashboard > Add User. I took a bit of time today to rework how Groupblog handles the add user process. With the new setup, every member of a group is added to the group blog at once. The process is put into motion when the blog’s administrator updates and saves the group’s Group Blog settings. Other members of the BP community who join the group after the initial blog setup are added automatically to the blog as well, in accordance with the settings that the admin has determined for member permissions. All the changes I made to the plugin are found in the main plugin file, bp-groupblog.php. You can download the modified file here: bp-groupblog.php.txt (don’t forget to make sure that the file is named bp-groupblog.php to make the plugin work). Just replace the stock version of the file with this one to make the changes. I intentionally did not clean up the plugin – all the original code is deactivated but still present beside the new code – because I wanted users to be able to differentiate what I had written from what the original authors had written (at least for now). If you use Group Forum Subscription for BuddyPress, you should upgrade to the most recent version, 1.4, released today. This version fixes a bunch of bugs, including one important bug that causes automatic subscription to fail for some members of large groups. As always, if you have any issues with the plugin, please let me know. I plan to include some big new features for the next release, so stay tuned. The upgrade from BuddyPress 1.0.x to BuddyPress 1.1 on the CUNY Academic Commons posed a number of challenges. Between the big changes to theme structure, the one-click installation of bbPress forums, and ongoing plugin compatibility issues, a lot of planning and testing was required. This week, I and the rest of the CAC development team finally made the switch. Over the course of a few practice upgrades in development environments, followed by an upgrade on the production site, I developed a pretty detailed set of instructions for myself. I thought I’d write up an annotated version of those instructions, for the benefit of anyone who might be facing a similar upgrade. The Academic Commons had previously been set up roughly along the same lines as Jim Groom describes here: with bbPress storing its data in a separate database, but through the cunning use of various clever plugins, sharing user data, cookies, and BP group info with the WPMU installation. BP 1.1 does things differently: the one click installation of BP forums expects to store its data in tables that exist in the BP/WP database. In order to save the old data, we had two choices: move the old data into the new structure, or make BP 1.1 recognize the old db setup. Fellow dev team member Chris Stein and I decided that the former choice would be the easiest and most future proof. Here’s how it was done. Move orphan forums into groups. Strictly speaking, this doesn’t have to be done first, but if you’ve got bbPress forums that aren’t attached to groups, you’ve got to get them in a group in order for them to display in BP. To the best of my knowledge, there’s no really way to do this from the bbPress or BP admin panels, but it’s easy to do manually. Set up a new group for each forum (a “Help” forum might get a “Help” group, for example), make sure the group has discussion forums enabled, and then find the line in table wp_bp_groups_groupmeta corresponding to the group_id of the new group and meta key `forum_id`, and change the meta_value to match the forum number of the orphan group. Rinse and repeat. Export your bbPress database to a local file. You’ll also need to make sure that all references to tables in the SQL dump are replaced with the proper names. For me, that meant replacing things like bb_posts with wp_bb_posts, but it might be different depending on the prefixes you use for bbPress and WP. If you’re not sure about how BP will name the tables, do the one-button forum setup in BP 1.1 (as a new installation) and post a test forum item, to make sure the forums get created. Then check out the database to see how BP formats table names on your install. Deactivate BP-dependent plugins. I once neglected to do this. If you do, and then deactivate BP, there is a very good chance that your entire site will go white-screen-of-death, as the plugins will be making reference to BP functions that do not exist. Check your plugin list three or four times to make sure you’ve deactivated each one that has to do with BuddyPress. I like to make a list, so that I remember which ones to activate after the upgrade (though some, like the bbPress integration plugins, won’t be necessary). Back up all your data. Always! I like to take a snapshot of the whole database, and then an individual export of the wp_sitemeta table. That way, if I screw anything up (say, by deactivating plugins in the wrong order!) I can bring the site back to life by reverting to a previous state that is known to work. Upgrade BuddyPress. Deactivate, upload, reactivate. Reactivate BP dependent plugins. I didn’t have too many issues with plugin compatibility, but you might, depending on what you use. Some plugins will not be necessary anymore, while others (like Forum Attachments for BuddyPress) become useful. Rename bp-themes. If BuddyPress sees the bp-themes folder, it will assume that you’re going to use the older, deprecated theme structure. I renamed it to bp-themes-old, and will remove it altogether once we’re 100% done with the migration. Move bp-sn-parent, bp-default, and your child theme to the main WP themes folder. In most cases this is wp-content/themes. Activate the themes in Dashboard > Site Admin > Themes. No need to activate bp-sn-parent, since it’s not used directly. Apply the child theme of your choice (either bp-default or your custom theme) to the main blog. You’ve exported and modified the forum data from the bbPress standalone version, but you’ll still need to get them into BP. Rename /forums. In our case, our previous installation of bbPress just happened to live at [BP install dir]/forums – exactly where the BP 1.1 forum directory goes. I don’t think it’d hurt anything to leave that folder named the way it is (because of the order in which BP handles URL arguments), but just to be safe I changed it to forums-old. Set up BP forums. In Dashboard > BuddyPress > Forum Setup, set up forums as a new installation. Drop the empty forum tables from the BP database. I can’t remember whether BP creates the forum tables upon installation or upon the first forum post, but in any case you won’t be able to import your old data properly without first dropping any table prefixed with wp_bb_. Import the modified local version of your forum data. I did it in PHPMyAdmin, which was easy because the file had been exported in the form of a huge INSERT command. If all goes well – and it should! – you should now be able to navigate to your groups and see the proper forum posts for that group. There are kinks we’re still trying to work out of the system. Some strange things happened to some users’ avatars after the upgrade. And tweaking the theme is turning out to be a hassle in a lot of ways. But overall, the migration of data – which I had lost a bit of sleep over – went extremely smoothly. Good luck! I got a TON of help from some readers of this blog, who were diligent about bug reports and extremely generous with their translations. Thanks so much for your help! By popular demand, here’s the method we used at the CUNY Academic Commons to get the BuddyPress admin bar to appear on the non-WP/BP portions of our site. In our case, that means MediaWiki and bbPress, but theoretically this method could work for any kind of software out there. I should note that I did not devise this method. It was invented by the inimitable Zach and Lucas of Cast Iron Coding. The concept is as follows. A bit of jQuery looks for a div of a certain ID on a page and, when it finds it, opens a dummy WP page that contains essentially nothing but the BP admin bar loader, which then appears on your page. Download the zip file containing the necessary files (admin-bar-integration) and follow these steps to make it happen. Upload the file page-component.php to your WP theme directory. Create a new page in WordPress. The page should be blank. In the Attributes box, select the Template called “Component (do not use)”. Name the page bpnavslug and publish it, making sure that you take note of the permalink. You’ll need that URL (relative to your site’s webroot) in step 4. If any part of your site creates a menu or a list of your WordPress pages, you’ll want to exclude this empty page from those listings. Find the function call wp_list_pages in your theme (often in header.php or index.php) and add an exclude argument. For example, if the page number of bpnavslug is 4, make sure all references to wp_list_pages read wp_list_pages('exclude=4'). Open the file bp-bar-integration.js. On line 3, you’ll see the path /bpnavslug/. Replace it with the path to the bpnavslug post you created in step 2. Upload bp-bar-integration.js to your server. For the sake of argument, I’ll put mine at /wp-content/js/bp-bar-integration.js. Now let’s turn to the application where you want the admin bar to appear. Open the theme file that contains the </body> tag. In bbPress, for example, this is usually footer.php. Be sure to replace the src attribute with path from your upload in step 5. A note: This method appears to be incompatible with the Google Analytics WP plugin (which appends Google’s JS to the footer of every WP page, and thus into bpnavslug, and ends up gumming up the works). You could probably get around this with some creative if-statements in the GA plugin itself. Good luck. Because of the diversity of people’s setups, I can’t guarantee that this method will work for everyone, nor can I provide support to everyone who tries it. But I do encourage you to post whether you’ve been successful in the comments, and to help each other figure things out. With a lot of help from users, Group Forum Subscription is becoming pretty stable (and widely used!). I’ll be releasing the next version 1.3 within the next few days, and one of the new features is localization. If you’re using the plugin for a site in a language other than English, I encourage you to have a go at creating a translation and, if you’d like, providing it to me for release with future versions. If you think you’ll find yourself translating often, I encourage you to follow the instructions at http://urbangiraffe.com/articles/translating-wordpress-themes-and-plugins/. The program PoEdit that the author recommends is (once you get it installed) very, very easy to use, and it remembers your translations of commons words and phrases for future use. If you take this route, please send both the .po and the .mo files to me or to cunycommons@gmail.com, and don’t forget to include your name in the email, blog comment, or .po metadata, so that you receive credit for your work. Make sure you use the trunk version of the plugin, available at http://svn.wp-plugins.org/group-forum-subscription-for-buddypress/trunk/, as the stable version does not contain the localization code. If you’d rather not install a program, you can download my French translation group-forum-subscription-fr_FR and edit it in a plain-text editor (like Notepad or TextEdit – not Word!). The lines beginning “msgid” are the original English. The lines beginning “msgstr” are the translations. Replace the French translations with translations in your language and post/send the file to me. If you’re using Group Forum Subscription for BuddyPress, you might like to know that I’ve just pushed out v1.1. There’s nothing new in terms of functionality, but a lot of small bugs have been fixed, as well as a fairly large bug that was affecting automatic subscription on the joining/leaving of BP groups. Download the latest version through your WP Plugins panel, or download it from wordpress.org. Thanks to r-a-y, MarkS, WestPointer, and other users for helping me to spot and squash those bugs! BuddyPress and bbPress connect nicely, giving BuddyPress groups a handsome forum interface, but the software has no native ability to allow users to receive email when their favorite discussions are updated. Without this functionality, it can be hard for users to keep up-to-date with forums, and subsequently the forums are less active than they otherwise could be. Group Forum Subscription is a set of plugins I’ve written (mostly on the BuddyPress side, with a small bbPress trigger plugin) that adds the missing forum notification functionality. GFS allows members of BuddyPress communities to subscribe to email notifications of new discussion activity. Subscriptions can be managed on a topic-by-topic or group-by-group basis. The plugin also has some administrative settings. Notable among these is the ability to set up email notifications for the first time after the plugin is installed, so that users are automatically subscribed to topics in their groups without having to set it up manually. This is a setup process that we’ll be running in the upcoming days here on the CUNY Academic Commons. Group Forum Subscription will currently work only on 1.0.x versions of BuddyPress – the brand-new BP 1.1 is not yet supported. I’ll be working on the upgrade very soon. Read more about the guts of the plugin or download it for yourself.